This 18-month study led by CCMI Researcher Dr. Alli Candelmo used the most current telemetry technologies to track the movement patterns of lionfish (Pterois volitans) along the reefs in Little Cayman. The project was seeking new ways to limit the ecological and economic impacts of lionfish both locally and regionally by utilizing novel advances in acoustic telemetry to increase the understanding of movement patterns of lionfish. Acoustically coded transmitters will be deployed to assess spatial and temporal patterns of the lionfish’s horizontal movement. This will include the tracking of routine (daily, monthly, seasonal) vertical migrations between shallow and deep reef habitats and environmental and insight into biological cues which may motivate these movement patterns. Information obtained from this study will be applicable to more effective site selection for targeted removal efforts. A principal output from this project will be the creation of a publicly accessible database and map of the lionfish population in Little Cayman, which help cullers select appropriate times and locations for removal efforts and thereby result in optimal protection of coral reef biodiversity from this immediate invasive threat. This project builds on CCMI’s research into the invasive species which established in 2009. Since 2012 CCMI has worked with the local community to maintain three experimental and three control (unculled) sites to understand the impact of culling. 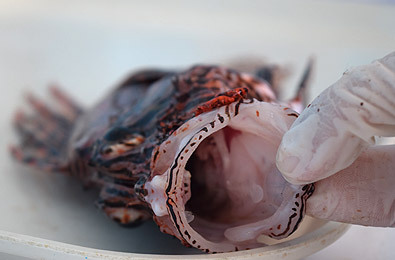 These sites and the ongoing work provide important information about the population dynamics and behaviour patterns of lionfish that can be applied to develop informed resource management strategies. A grant of 99,880.17 Euros was awarded by the European Union’s BEST 2.0 programme to improve the management of the invasive lionfish. The project is also supported by the Guy Harvey Ocean Fund. To see how culling is working in Little Cayman and to make a difference to this project, please CLICK HERE to see our maps and resources. This document has been produced with the financial assistance of the European Union. The contents of this document are the sole responsibility of CCMI and can under no circumstances be regarded as reflecting the position of the European Union.